Far from being a fad, food dyhydrating is one of the most ancient, effective, and nutritous ways of preserving food. Now, at last, there is a book that teaches absolutely everything there is to know about using an electric food dyhydrator to dry foods at home—and gives more than 100 foolproof recipes for scrumptious snacks and meals made from dried foods. With this extraordinary book, you can learn how to cross junk food and expensive store-bought snacks off your family’s shopping list—and add to your cupboard homemade, preservative-free fruit leathers, candied apricots, beef (and fish) jerkies, “sun” dried tomotoes, corn chips, banana chips, and so much more! 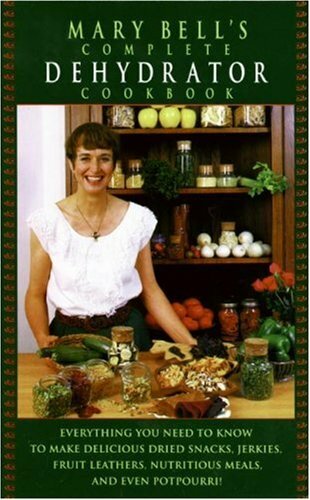 Mary Bell gives specific techniques and instructions for preparing every kind of fruit (from apples to watermelon) and vegetable (from asparagus to zucchini). She also provides important shopping tips for buying an electric food dehydrator. The recipes for cooked meals (including mushroom soup, sloppy joes, pesto, and moist banana bread) will make this book a kitchen classic. And recipes for lightweight, filling trail snacks mean that the book will travel, too. Additional chapters explain to how make herb seasonings, granolas, celery powder, cosmetics, dried fruit sugars, potpourri—and even pet treats! Food drying is an excellent way for gardeners to preserve their produce. It is a great way to make healthful snacks for the kids. It’s perfect for the new wave of thrifty consumers who can’t bear to spend dollars at health food stores for treats they cold make for pennies themselves. And food drying doesn’t use chemicals or preservatives—so it’s great for you and for the planet, too!